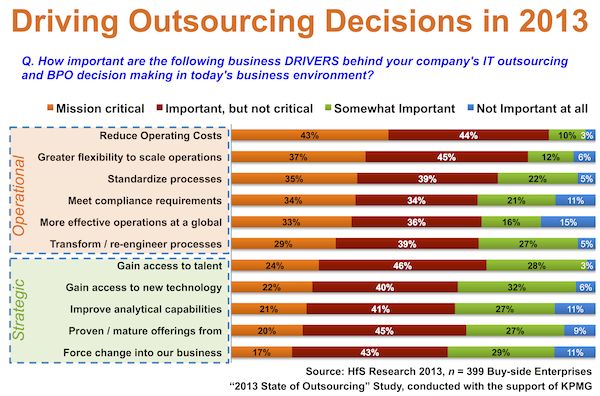 399 major buy-side enterprises have spoken about their 2013 outsourcing plans, and barely a twentieth of them are looking to reduce their outsourcing scope across any IT or business function in 2013. Moreover, half of them are looking to increase their outsourcing of application services, four out-of-ten their finance and accounting, and a third their HR. In addition, there is a notable pick up in newer sourcing areas, such as analytics and legal. While, on the surface, this data isn't exactly surprising, what it's telling us is the vast majority of enterprises are eagerly looking to industry standard offerings as a priority. We've been lauding the old "ADP payroll analogy" for several years now, where there is little discernible business reason to run your payrolls yourself these days, and this is ringing true for the rest of the operational functions: being competitive with business operations is achieved by standardizing onto best-in-class processes. And to achieve that standardization is, really, quite straightforward - move these processes onto proven technology platforms and have them operated in a cost-efficient manner. For most organizations today, they've failed to do this effectively inhouse (through many years of pain and wasted investments) and shifting them over to a third-party has forced the issue and got them from A to C.
It seems that polls have pointed to slower growth in outsourcing ever since the finacial crisis hit in late 2007. But the industry leaders keep thriving. So healthy demand is there - just not enough to satisfy all the players that crop up. The industry as a whole is changing, how that change will continue to materialize is still to be determined no matter what the main stream media says, although keep in mind that perception is everything. I suspect one significant influencer of that change is the rise of viable hosted software (cloud, saas, etc.) solutions and their ability to offer multi-tenant, highly configurable solutions… or at least the perception of. Gone are the days of choosing between a monolith, expensive, client server ERP and an expensive, one size fits all outsourcing solution. Yes.. that is an exaggeration. Interesting data points Phil! The debate in-house vs outsourcing has been going on from a long time, and with the presidential elections cloaking outsourcing as "evil", it was all the more important to reveal the true picture. The core objective of any business is to grow. To achieve this in today''s globalized, sophisticated and technology-driven world, companies will need to look for alternative sourcing and partnership opportunities--its not a choice but a necessity. In addition to the obvious cost advantage, outsourcing also provides strategic benefits such as access to a wider talent pool, global reach and delivery capabilties, specialized resources and processes, and faster time-to-market. It also allows organizations to stay "asset-light", a key criteria in the post-recession era. You might also enjoy our blog: http://www.minacsblogs.com/Vision2020/CrystalBall2013ACEOsViewofBusinessandOuts.aspx that discusses the changing role of business process outsourcing service providers in 2013 and beyond. In a world that demands aggressive investment and innovation, value partnerships with third party service providers can offer advantages that go beyond the traditional onshoring/offhsoring debate. Today "right-shoring" (choosing the most advantageous business model and the most optimum delivery location), is the new buzzword - a new face of outsourcing! Phil -- Excellent piece of work! I wonder what strategies enterprises are adopting to harvest the value inherent in their Outsourcing contracts. Typically, companies get an annual technology plan from their Outsourcing services provider. Enterprises need to develop a higher level of maturity and demand results beyond the annual plan and contract compliance -- Innovation! I don't really understand why there's should still be a outsourcing debate in the first place. It helps both entrepreneurs at the same time provides jobs to constituents of some developing countries such as Philippines. You know what bothers me - it's that outsourcing is put on a negative light because of all these media frenzy. Reality is, we are now living in a borderless economy where work is not anymore defined by place, but function. More people are working-on-the-go, outside the traditional office setting.. My point is, can we just stop using the word 'out' and 'in' -- just call it plain 'sourcing'. Phil, you always manage to conclude everything nicely and smoothly. It’s actually enlightening to know some companies may have been affected with this post of yours and think about outsourcing. As what Tina Vargas says here, I also don’t understand why there are such arguments about this process. Outsourcing is proven to be effective once it is properly planned and implemented. Keep it up! 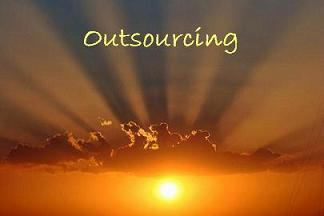 outsourcing is somebody who is self-employed and is not committed to a particular employer long term. These workers are sometimes represented by a company or an agency . Freelance practice varies greatly. Some require clients to sign written contracts while others may perform work based on verbal agreements.